I have noticed something new about Jason during the last two race weekends. He is starting to be part of a team and not just his team. He is no longer the “Lighting McQueen” thinking only of what he does. He is understanding what it takes to be part of a racing team and part of a race. The driver is the celebrity, and without their talent and skill there would be no racing, but without the rest of the team, the track owner, the corner workers, and all of the people it takes to put a race, on there would be no race. A few weeks ago, after his first regional kart win, the first thing he said to me was “Happy Father’s Day” and “we did this as a team”. That right there, made me proud, but this weekend, at Grattan, I was a bit choked up when I watched his race video with some of our kart friends. 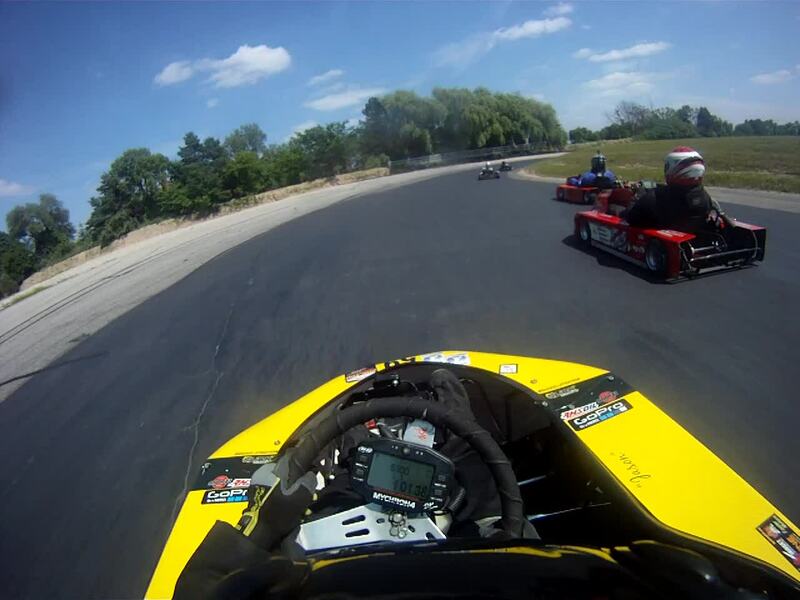 After the checkered flag, all karts take a lap to cool down and then pull into the pits. As he passed each flag stand and corner worker he gave them a “thumbs up” of thanks and acknowledgement of their work. This made me happier then any trophy he could have brought home. Thank your corner worker today Grattan Raceway Park is by far one of our favorite tracks. For a the driver it is one of the most challenging tracks in the mid-west, with a mile long straight and lots of difficult corners. It is only perhaps surpassed by Road America. It has also some the more unusual features of a swimming pool, a stocked fishing pond, and an off road motorcycle track. It is difficult to tell whether Jason likes fishing more than racing. 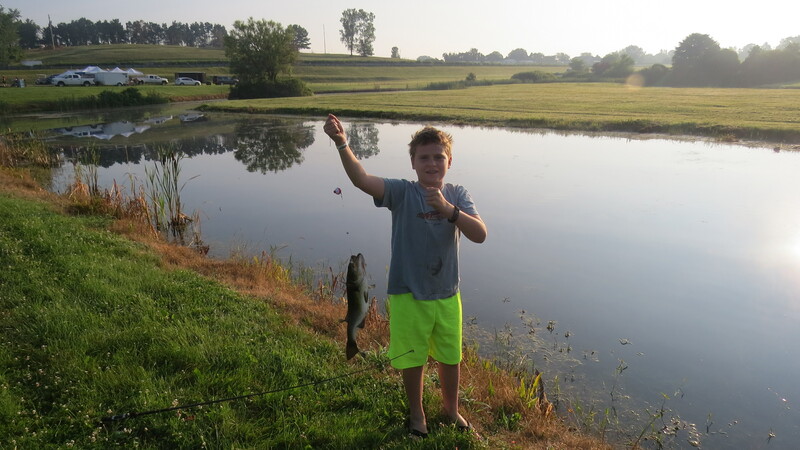 When he is not doing something related to his kart he is down by the pond fishing for an assortment of game fish, sunnies, bluegill, bass, and bullheads (yuck). O n Saturday, we were visited by my friend Jordan Lindberg and his son Myles. Jordan is a renowned trout fisherman and owner of Stardust Memorials. It has been a few years since we have been able to hang out, so we’re really glad they could make the trip over. Stardust Memorials has been a sponsor of Wild Duck Racing for three years and this their first visit to a kart race. Thanks Jordan and the Stardust Memorials team for your help. We are glad to be a part of your growing business. The weekend’s racing was great. Jason drove stupendously on both Saturday and Sunday running a very fast and clean. Last year he was running 1.48 second laps and this year he ran 1.45 second laps. Quite an improvement. We also had some competition from another father and son team who came with a group of teams from the Detroit area. It was great to see another team working hard and joining the fun. Jason brought home two first place trophies. All in all a great weekend. Jason will be at the Monday Night Car Show with his karts on July 20th, so come on out and see him. Following that, we will be traveling to Eau Claire, WI for the second weekend of the Briggs and Stratton 206 cup on July 25th and 26th. Thanks to all of our racing friends and the new ones we made this weekend. Karen, Happy Anniversary. Who knew that this could come from that hot day in July 14 years ago? Thanks to Regan at 4 Cycle Central for our motor and help with our new trailer. Good luck to Katie this weekend in her first horse riding competition. You have it in you.